To trigger this quest you need to complete the quest Getting Started, which will have you planting Parsnip Seeds and harvesting the results. Pretty easy. Like Getting Started, Advancement teaches you about another aspect of Stardew Valley - in this case, how to Craft. Advancement entails two things. 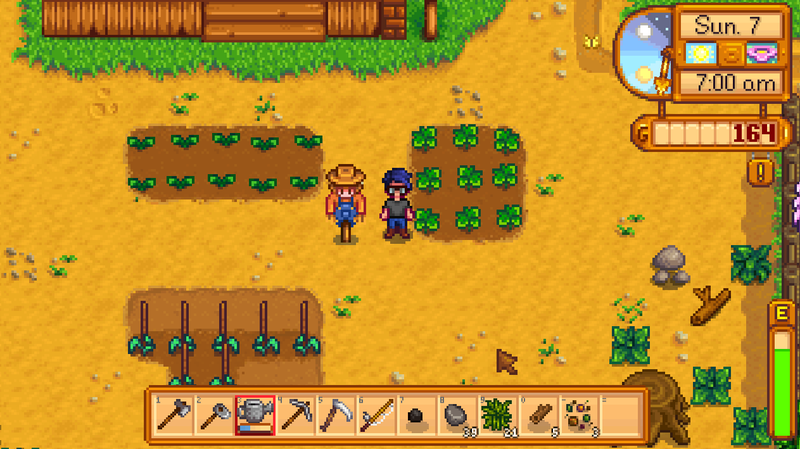 The first is raising your Farming Skill to level one. You’ll achieve this by harvesting the Parsnips and placing them in the collections bin. You’ll gain experience and level up overnight, which will thereafter allow you to Craft Scarecrows for your farm. 50 Wood. You can easily get Wood by chopping down trees or slicing up fallen logs with the Axe. 1 Coal. Pull out your Pickaxe and smash up rocks to find Coal. It’s somewhat uncommon, so you may be bashing stone for a while. 20 Fiber. Another easy find - go at bushes with either the Axe or the Scythe, or slice up tall grass with the Scythe alone. Create the Scarecrow on the Crafting tab to complete the quest. You can then collect your 100 gold review from the Journal entry for Advancement.